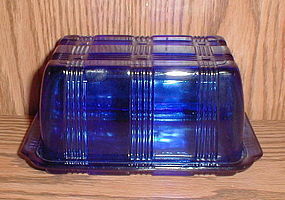 Cobalt, Hazel Atlas, Crisscross 4x4" Refrigerator Dish with cover in excellent condition. No damage or use marks. All I find is some shelf wear on the bottom on the 4 corners. Cobalt Hazel Atlas 1 lb. 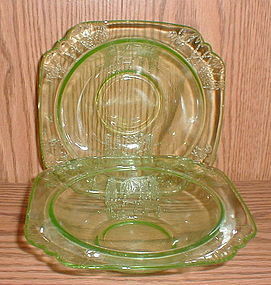 Crisscross Butter Dish in excellent condition. No nicks, chips cracks or flea bites. No knife marks. Really a nice piece that shows no signs of use. Authentic and NOT a repro. 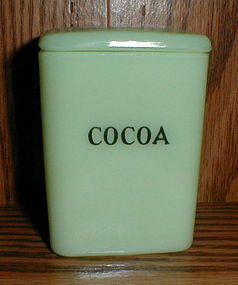 Jeannette Glass, jadeite, 3" Childs Cocoa Canister, with lid, in excellent condition. No damage to either the canister or the lid. Excellent lettering. 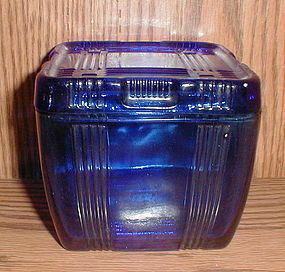 Some of the usual mold marks on the lid. 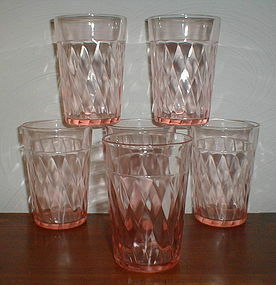 Pink "Diamond Optic" 4 1/8" Tumblers by Hazel Atlas Glass. All are in excellent condition with no damage or use marks. 6 are available. Green, Hazel Atlas, 1 lb. 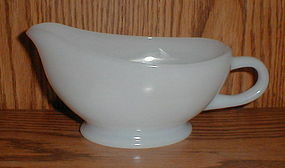 Butter Dish in excellent condition. No damage and no knife marks. Might be listed as unused or close to it. 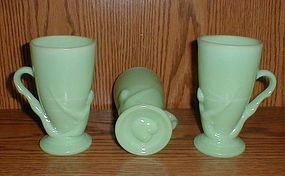 Authentic, McKee, Jadeite "Bottoms Down" Mugs with the Pat 77725 on the bottom. All three are in excellent condition with no damage. Three are pictured, only one is left. It is mint except for a TINY bubble on the bottom. 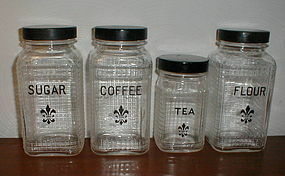 Fleur De Lis Canisters by Hazel Atlas, all in excellent condition with no damage and excellent decals. Lids are original and show a little use, but not much and are still very nice. Coffee, Sugar and Flour Canisters - $35.00 each. Tea Canister - $25.00. Pepper Canister (not pictured) $20.00. Tall canisters are 7", Tea is 5 1/2" and Pepper is 4 1/2". 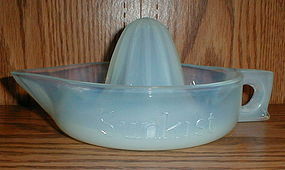 Opalescent, white, SUNKIST Reamer is excellent condition with no damage or flea bites. Hazel Atlas, "Moderntone" Blue Stripe Mugs in excellent condition with no damage. Three are available. 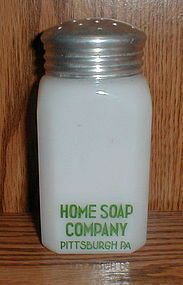 5" (including lid) shaker from the Home Soap Company, Pittsburgh, PA, in excellent condition with no damage. Lid is original, has one dent, but is still in very good condition. 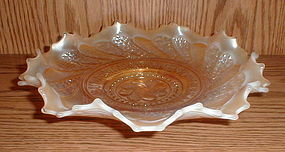 Peach Opalescent "Roundup" Plate 2" x 9"
Dugan Glass, Peach Opalescent, "Roundup" Plate in excellent condition with no damage and good color. 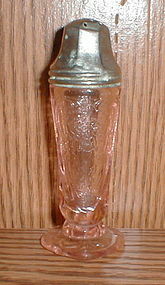 9" diameter and 2" high to the tip of the highest "ruffle". 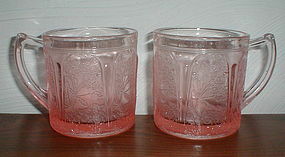 Red Flower Pots Range Set by Hocking Glass. Grease Jar, Salt, Pepper, Sugar & Flour. All glass, decals and original lids are in excellent condition with no damage and very little, if any signs of use. Nicest complete set like this that I've seen in a long time. 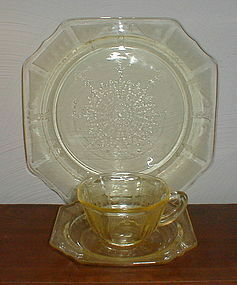 Yellow/Topaz "Princess" 9" Dinner Plate, Cups and Saucers, all in excellent/mint condition with no damage or use marks. 1 9" Dinner Plate $10.00. Eight sets Cups and saucers available. $10.00 for one set or $8.00 each on orders of two or more. NOTE: 6" Sherbet Plate and Saucer are identical. 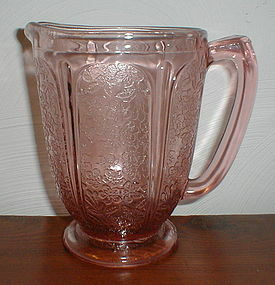 Hazel Atlas, pink, Royal Lace Shaker in very good condition. Glass is excellent with no damage. Lid is original, but does have some salt corrosion and one dent. No corrosion cracks or holes.